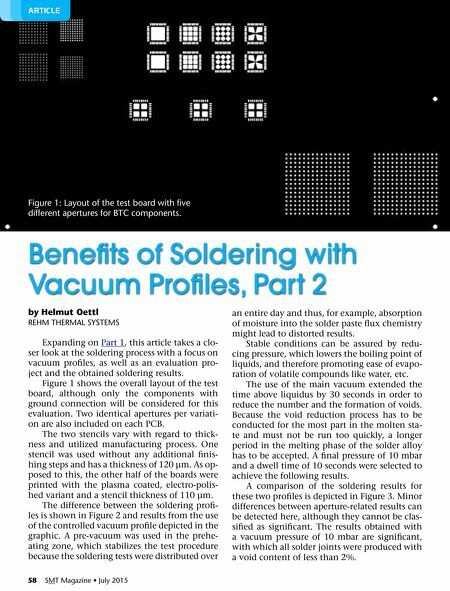 58 SMT Magazine • July 2015 ArtiCle by Helmut Oettl rEHM THErMAl SYSTEMS Expanding on Part 1, this article takes a clo- ser look at the soldering process with a focus on vacuum profiles, as well as an evaluation pro- ject and the obtained soldering results. Figure 1 shows the overall layout of the test board, although only the components with ground connection will be considered for this evaluation. Two identical apertures per variati- on are also included on each PCB. The two stencils vary with regard to thick- ness and utilized manufacturing process. One stencil was used without any additional finis- hing steps and has a thickness of 120 µm. As op- posed to this, the other half of the boards were printed with the plasma coated, electro-polis- hed variant and a stencil thickness of 110 µm. The difference between the soldering profi- les is shown in Figure 2 and results from the use of the controlled vacuum profile depicted in the graphic. A pre-vacuum was used in the prehe- ating zone, which stabilizes the test procedure because the soldering tests were distributed over Benefits of Soldering with Vacuum Profiles, Part 2 an entire day and thus, for example, absorption of moisture into the solder paste flux chemistry might lead to distorted results. Stable conditions can be assured by redu- cing pressure, which lowers the boiling point of liquids, and therefore promoting ease of evapo- ration of volatile compounds like water, etc. The use of the main vacuum extended the time above liquidus by 30 seconds in order to reduce the number and the formation of voids. Because the void reduction process has to be conducted for the most part in the molten sta- te and must not be run too quickly, a longer period in the melting phase of the solder alloy has to be accepted. A final pressure of 10 mbar and a dwell time of 10 seconds were selected to achieve the following results. A comparison of the soldering results for these two profiles is depicted in Figure 3. Minor differences between aperture-related results can be detected here, although they cannot be clas- sified as significant. The results obtained with a vacuum pressure of 10 mbar are significant, with which all solder joints were produced with a void content of less than 2%. figure 1: layout of the test board with five different apertures for bTc components.